The final meeting in a storied high school football rivalry will take place on Friday night when Twin Valley League rivals Baileyville B&B and Hanover battle for a trip to the Eight-Man, Division II state title game. It has been well documented that the B&B Falcons are in their final season before consolidating with Nemaha Valley to form the Nemaha Central Thunder next fall. 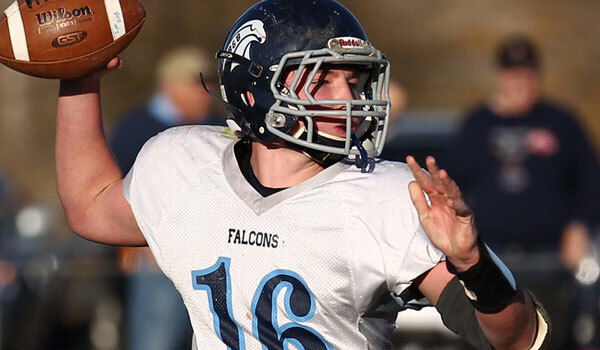 The Falcons are trying to close out their school with a sixth consecutive state championship game appearance and the school’s fifth state football championship. The Falcons have won state titles in three of the past five seasons. Friday will mark the third time since 2010 that the Falcons and Wildcats have played twice in the same season with the second match-up always coming in the state semifinals. B&B won those first two semifinal showdowns 48-22 in 2010 and 50-20 last season. Both Falcon victories came after extremely close regular season games between the two teams. B&B won 31-28 in overtime back in 2010, while surviving a double-overtime 52-46 battle last season. The Falcons are led by senior quarterback Dustin Rottinghaus who has passed for 1,945 yards and 33 touchdowns against only five interceptions. Rottinghaus completed 22 of 41 passes for 378 yards and two touchdowns. He connected with Cameron Haug five times for 157 yards and a touchdown, Blake Deters nine times for 129 yards. The game was tied at 14 at halftime, and Hanover had a chance to tie the game, but B&B’s Dylan Schmitz returned an interception for a touchdown to seal the game for the Falcons. Deters leads the Falcons with 45 receptions for 891 yards and 17 touchdowns, while Haug has 40 receptions for 767 yards and 12 scores. Junior quarterback Andrew Bruna leads a Hanover team that has been dominant in its first two playoff wins. The Wildcats have posted a 52-0 win over Hope in the Lions final game before consolidation, and a 60-6 win over South Barber on Saturday. Bruna was exceptional against South Barber passing for more than 230 yards and four touchdowns and adding 220 yards rushing and four more scores. Even more impressive than Bruna’s performance on Saturday was the Wildcat defensive effort against a South Barber team that entered averaging nearly 55 points per game. Hanover held Chieftain quarterback Peyton Yandel to minus seven yards rushing on ten carries and just 71 yards passing. Yandel finished with 1,620 rushing yards and 1,147 passing yards on the season. Hanover will need another stellar defensive performance and a solid game from Bruna to snap a string of eight straight losses to B&B dating back to 2007. St. John’s-Tipton has enjoyed a big turnaround in the last four years from 0-9 to 2-7 to 8-2 to 11-0. The Blujays’ junior quarterback Trey Dubbert leads an athletic, experienced group that includes senior running back Connor Eilert and senior 6-foot-4 wideout Luke Eilert. This is a rematch from the first round last season, a 56-6 Wallace County victory. Wallace County easily leads the eight man ranks in scoring defense with just 46 points allowed behind a strong front-three in seniors Dalton Walker, Tyrell Springsteel and Clay Schemm. The Wildcats were tested by Dighton last week, but came up with multiple fourth down stops against the Hornets in a 51-6 victory. Wallace County, which lost to Thunder Ridge in the sub-state championship game last season, moves on to the state title behind its experienced group of seniors.